Put the hot summer breeze to good use with these cheery, easy-to-make pinwheels. With just a few items from a craft store and 15 minutes, you can spin a hot day into a fun one. Download the instructions and printables. 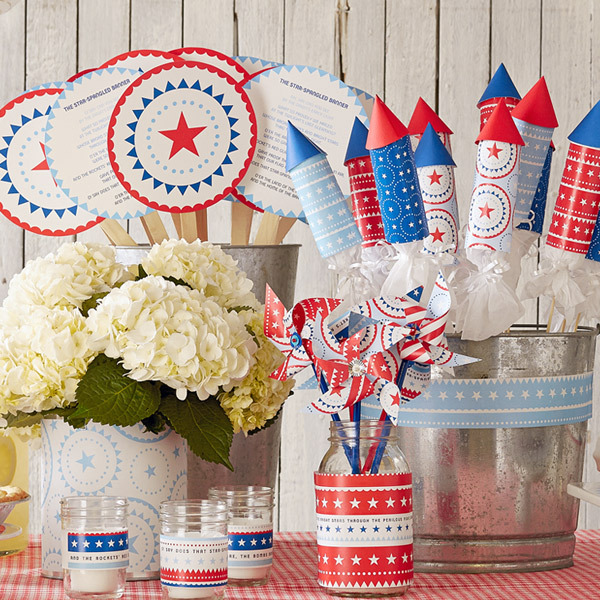 Blast off your party with these fun favors that are a cinch to make. Download the instructions and printables. Use the printables, double-stick tape and a few yards of string to make a banner for your buffet table. Or you could make a festive photo op by stringing many strands of them vertically from a tree branch or taped to a wall or fence. Fan the flame of patriotism with this useful craft. For each fan, download the patterned printables and print on card-stock weight paper. Cut them out and glue them back-to-back with the tip of a craft stick in between the layers. Let dry, and then keep yourself cool. Download the printables and punch out two of the circular patterns for each pick (or carefully cut them out if you don’t have a craft punch). Tape them back-to-back with double-stick tape and a toothpick tip between them. Download our patriotic pattern printables. The large patterns are perfect for cutting into strips to wrap around paper lanterns, napkins, mason jars and beverage buckets; or tape a few together for “patchwork” placemats or a table runner.